TV show dates: May 12, 2018 — present. Performers include: Benedict Cumberbatch, Jennifer Jason Leigh, Hugo Weaving, Blythe Danner, Allison Williams, Anna Madeley, Pip Torrens, Jessica Raine, Prasanna Puwanarajah, Holliday Grainger, Indira Varma, and Celia Imrie. At first, Melrose appears to be nothing more than a pleasure-seeking rover. Money seems to be no object, where he is concerned. Above wine, women, and song, this well-heeled libertine has but one priority — his heroin addiction. Like all of his crutches, Patrick relies upon drugs to numb the pain of the childhood he spent in the clutches of his abusive father. When Patrick’s father dies, it feels like a moment to change things for the better and for good. It is not going to be an easy journey, though. His father, David (Weaving), was fond of saying, “Only the best, or go without.” Despite his aristocratic background, He owed everything to his wife, Eleanor (Leigh) and her nouveau riche family. If there is anything he was more fond of than drinking his life away, it was causing and relishing in the humiliation of others. He was the scourge of his family. An American, Eleanor’s family came by their new money the old-fashioned way — they earned it running a cleaning fluid business. Her wealth enabled her husband, and later their son, to indulge in all manner of hedonistic pursuits. Longing to get out from her husband’s thumb, when the opportunity arose, she left Patrick alone with him. Mary Melrose (Madely) met Patrick during one of his sober periods and later married him and gave him two sons, Robert and Thomas. She understands his traumatic past and wants to support him, but his substance abuse and wandering eye take a toll on her devotion to him. Meanwhile, there’s Patrick’s best friend, Johnny (Puwanarajah). A fellow addict, Johnny helps Patrick during his low moments and they decide to pursue recovery together, though in different ways. Ever his friend’s confidant, Johnny is the first to learn Patrick’s long-held secret. Julia (Raine) is Patrick’s sometime friends-with-benefits. Perhaps if they’d met at another time in their lives, they could have made a go of it. As an adult woman in a dull marriage, when she considers Patrick, she wonders what could have been and if it could still be. Patrick has endured a lot of pain in his life — both familial and self-inflicted. Can he overcome the damage done to him by his abusive father and the mother who failed to stop it? Stay tuned. What do you think? Do you like the Patrick Melrose TV series? Should this Showtime TV show be cancelled or renewed for another season? 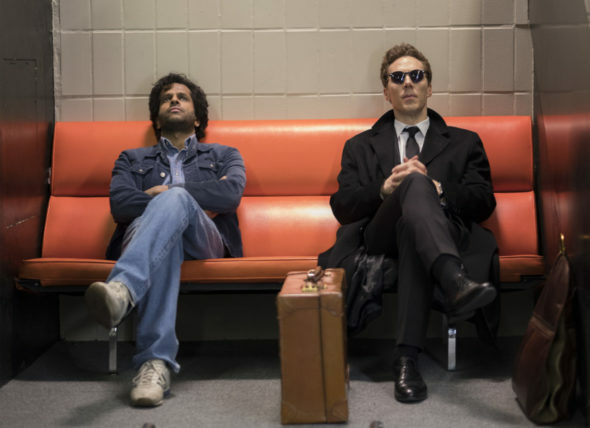 More about: Patrick Melrose, Patrick Melrose: canceled or renewed?, Patrick Melrose: ratings, Showtime TV shows: canceled or renewed? we absolutely love Patrick Melrose Show.